Coming to Campbelltown as part of Cinemania exhibition from this Friday: Lisa Reihana’s Tai Whetuki – House of Death Redux, 2015-16. Cinemania, the first ever Australian survey of New Zealand artist Lisa Reihana will be on at Campbelltown Arts Centre from this Friday, January 12. Part of the Sydney Festival 2018, the exhibition will be on until March 29 this year. Cinemania showcases three decades of video and photographic works underscoring Reihana’s international status as a pioneer of experimental video art and multimedia installations. Cinemania reveals the full spectrum of Reihana’s practice from early experimental works in digital video such as Wog Features, 1990 to in Pursuit of Venus [infected], 2015-17, Lisa’s most ambitious work to date which premiered at the 57th Venice Biennale in 2017. Almost 10 years in the making, this work is a cinematic reimagining of the French scenic wallpaper Les Sauvages de la Mer Pacifique, 1804-1805, or The Voyages of Captain Cook, and includes scenes featuring Campbelltown’s local Dharawal community. The exhibition, which traces Reihana’s ongoing preoccupation with costume and identity and her interest in fiction and non-fiction characters, will feature more than 24 artworks, including the early experimental Native Portraits, futuristic films, dystopian photography and immersive environments, such as Fantastic Egg, and Tai Whetuki – House of Death Redux. “We are thrilled to be presenting the first Australian survey of Lisa Reihana at Campbelltown Arts Centre,’’ said Michael Dagostino, the Campbelltown Arts Centre director. “Lisa was instrumental in forging the development of time-based art in New Zealand, and her technically ambitious works have gained her international acclaim, including representing New Zealand at the 2017 Venice Biennale,’’ he said. “Lisa assumes many roles in the creation of her work, that of the artist as well as actor, filmmaker, photographer, director, historian and dramaturge. 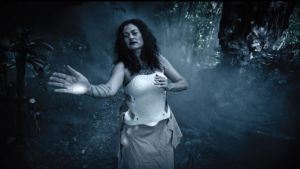 “Her practice is driven by collaborative work with first nation communities, across Australia and the Pacific, and she has continued this commitment by working with the local Dharawal community here in Campbelltown,” he said.